The California Supreme Court on Thursday unanimously sided with the mother of the late Robert Wendland, who fought a six-year legal battle to keep her son on life support. The Supreme Court ruled 6-0 that relatives can’t remove feeding and hydration tubes from a patient who is not in a persistent vegetative state or unconscious, but is otherwise incapacitated. Wendland, who died last month from a bout with pneumonia, suffered severe brain damage following a 1993 auto accident. He spent eight years hooked up to feeding and hydration tubes at Lodi Memorial Hospital’s transitional care unit. The 49-year-old Stockton man was left unable to speak, feed or care for himself, but wasn’t in a constant vegetative state, doctors said. His wife, Rose Wendland, had fought to remove his feeding tube, saying he had twice told her he would not want to live like a vegetable. But Wendland’s mother, Florence Wendland, claimed he was responsive to some simple commands and she argued that life support should not be removed. The justices didn’t have to rule in the case after Wendland’s death, but they decided to clarify the dispute in the state probate code. 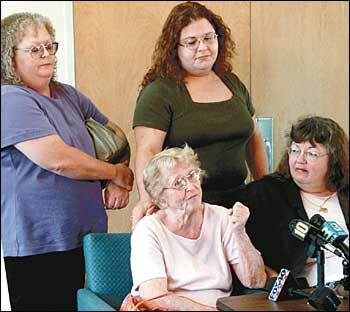 Florence Wendland, with her attorney and other relatives at the press conference, said the ruling is bittersweet following her son’s death, but that it sets precedent for others who might find themselves in a similar position. “It shows that Robert didn’t die in vain,” she said. Lodi attorney Janie Hickok Siess, who argued the case on Wendland’s mother behalf, echoed her sentiment. The legal battle began when Wendland’s wife and conservator wanted to remove his feeding tube in 1995. Rose Wendland said she was following her husband’s wishes by directing a doctor to stop the treatment and allow him to die. Robert Wendland never put his medical care wishes in writing in the form of an advance health care directive or living will. He reportedly told his wife months before the accident he didn’t want to live like a vegetable. Wendland’s mother fought removing life support all the way to the state Supreme Court, saying he could respond to her voice, squeeze her hand and participate in some adapted activities. Rose Wendland said Thursday she didn’t want to pull the plug, but was trying to honor her husband’s wishes. The mother of three said the family is still grieving Wendland’s death. Rose Wendland said she’s undecided if she’ll continue the legal battle to the U.S. Supreme Court. The justices decided that, in order to withdraw life-sustaining treatments, conservators must establish clear and convincing evidence that the patient would want to refuse such medical care. They concluded Robert Wendland’s two conversations with his wife prior to the accident didn’t constitute the evidence needed to withdraw life support. With the ruling, the high court affirmed San Joaquin County Superior Court Judge Bob McNatt’s decision that conservators needed to show the higher level of proof. The decision also reverses the state appellate court ruling that McNatt erred in requiring a higher standard than the conservator simply considering the conservatee’s best interest in good faith. The Supreme Court also said it wasn’t setting a broad standard when conservators could pull the plug on incapacitated loved ones. Instead, the decision affects a small minority: conscious patients who’ve left no formal health care directions and have conservators looking to withdraw life support with the intent of causing death. A group of 43 medical ethicists had urged the court to abide by the wife’s wishes. Others supported the decision, saying it will guard people from death by starvation and dehydration. “This is really a wonderful decision that protects the most vulnerable,” said Rita Marker, an attorney and executive director of the International Task Force on Euthanasia and Assisted Suicide based in Steubenville, Ohio. Marker said the decision makes it more challenging to pull the plug on incapacitated patients with severe mental retardation or brain damage from strokes or traffic accidents.